It has struck me in the last few weeks that not only does God have a plan for us but it is so BIG we cannot find a word to fit. You know when you self talk about where you thought you would be by 30 and then by 40 and so on, you come to realization that there are many things that have happened in our lives that have shaped us into who we are. Some of us come from homes that are calm and ordered and always structured and some like me come from a background of craziness. I mean craziness in a good way. I love that God has hard wired me to be less organized as I age and more impulsive. That he has shown me He can use in many ways most of which I would never have dreamed of. That my love of people and zest for being around people doesn't have to be all the time, and how much I value now my quiet time alone on the farm. I watch TV once a week for House, rarely go on You Tube, Google searches, Facebook, but spend lots of time on writing emails and answering them. I love connecting with people. There are sayings about how we change, the forwards that poke fun at aging; that as we age we are supposed to be maturing. Maturing means moving to a place of understanding and trusting in God without exception. I know right now some of you are saying you "Colleen you will never mature" LOL but I see that in terms of having fun and doing adventurous things. Maturing in the Lord is a completely different concept. I am so glad that God doesn't give report cards. This week I am lucky to be sitting at a C+. I have second guessed the plans He has started in me, I have lost faith, I have struggled with insecurity, questioned a million little details, felt inadequate for any ministry and called in question my part in the great commission. Praise the Lord the pity party is on its way out. God can use me, God will, and I pray that I will be ready to do what He asks of me, daily and not just ilook at the big picture. His plan is bigger than we can imagine so we try and grasp the bigger picture, but today He is reminding me, baby steps. There is a Haitian proverb Piti piti zwazo fe niche. Little by little the bird builds his nest. 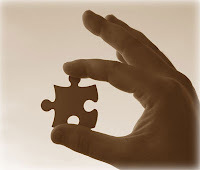 Today I plan to look at today's piece of the puzzle, nothing more.